Simona Langella: Francisco de Vitoria y la cuestión del tiranicidio, SvSal WP No. 2015-04. 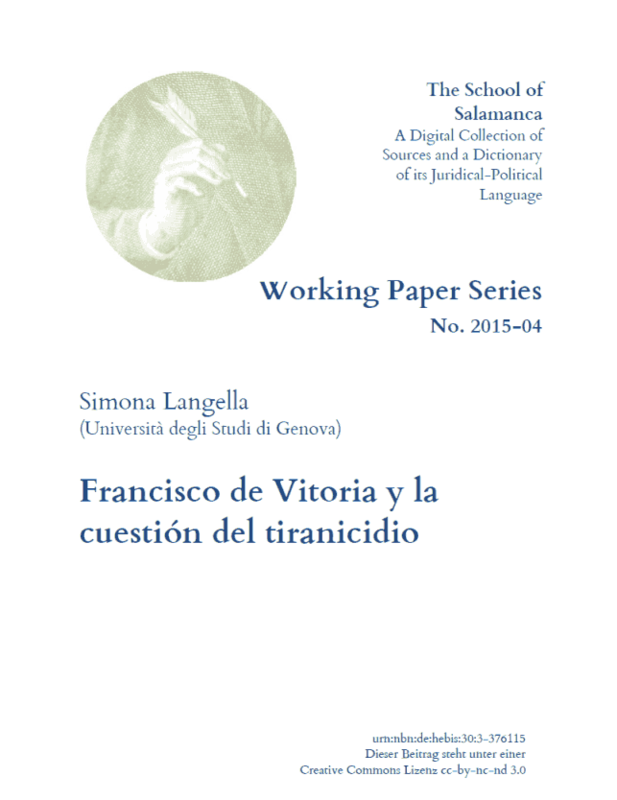 After analysing the subject of tyrannicide in Thomas Aquinas and Bartolus de Saxoferrato, the article shows how Francisco de Vitoria, fully aware of the solutions offered by previous authors, approached the topic in an innovative way, though in line with the previous tradition. As a matter of fact, the solution proposed by Vitoria is based on the affirmation of a right to self-defence, intended as a natural, inalienable right of individuals and communities; this right can always be exerted by the subjects of a ruler who becomes a tyrant. This way, Vitoria asserts the right of resistance against an unjust and unfair authority, in terms of a subjective right, the right to self-defence, while at the same time setting its limits, remarking the need for every individual to respect and comply with an objective order of justice. Hence, his prohibition to kill a man, even if a tyrant, without a fair trial. Therefore, by discussing the lawfulness of tyrannicide, the article shows that the work of Vitoria contains a sound theory of sovereignty, along with the strong affirmation of individual natural rights. Indeed, on the one hand, Vitoria was inspired by a tradition of thought considering the creation of political societies as a consequence of natural human sociability; on the other hand, he developed a consistent theory of subjective rights starting from the need of individuals to join one another for the purpose of an ethically fair and gratifying life.